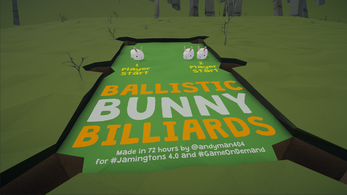 Help the bunnies get ready for bed by bumping them into their rabbit holes in this hilarious billiards-like game. For 1 or 2 players. Made in 72 hours for Jamingtons 4.0 game jam (theme: reaction) and Games on Demand game jam (based on Hope's theme of a thriving bunny game, and inspired by Claudia's theme of tsum tsum). 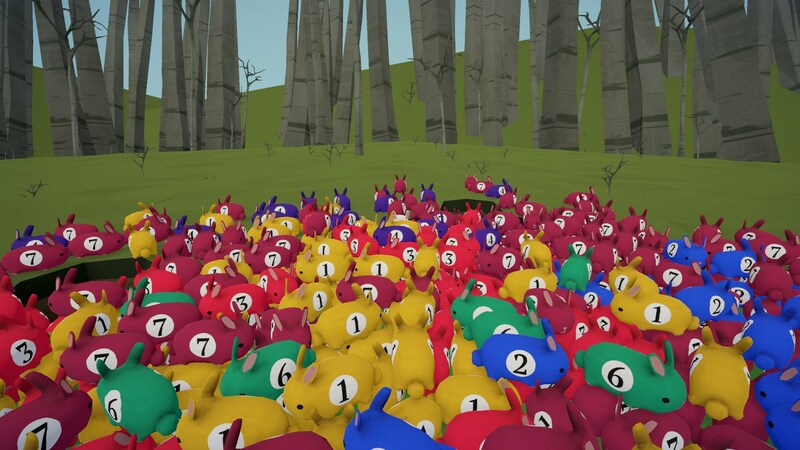 This 3D game is inspired by 8-ball pool, except it is played with tsum tsum bunnies that have babies whenever they bump into each other too hard. 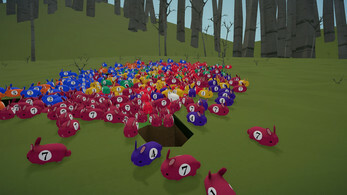 This could lead to an uncontrollable chain reaction of bunnies breeding. The goal is to use your white cue-ball bunny to bump all of your bunnies (either solid-colored or striped) into the holes, and then push the black 8-ball bunny into a hole. 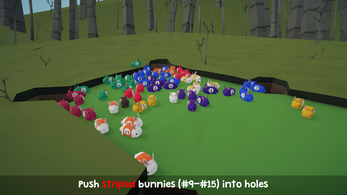 The first ball that goes into the hole determines whether your bunnies are the solid-colored (#1 - #7) or striped bunnies (#8 - #15). If one of your bunnies goes into the hole on your turn, all of its kin (bunnies with the same number) also disappear into the hole. (I didn't have time to make effects for it.) 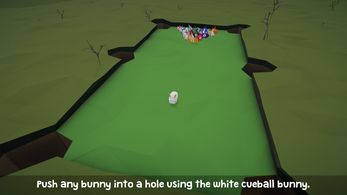 You get an extra turn also, unless your cue-ball rabbit also falls into a hole. If you push the 8-ball bunny into the hole before your other bunnies have all gone into the hole, then you automatically lose. Tools: Unity, Blender, Substance Painter, Gimp. Attributions. Music: Divertissement - Pizzicato (from the ballet Sylvia) by Kevin MacLeod (incompetech.com, Creative Commons by Attribution 3.0). Font: Grandstander Clean by Tyler Finck. 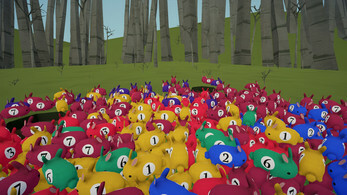 Squeak Toy Squeeze sounds by Aiyumi (Creative Commons 0). The concept is HILARIOUS to say the least. Greatly executed, too. I had a great laugh when the breeding chain reaction happened. Definitely keeping this one on my PC to show it to my friends.